Don't forget that if you're linking up with us today, grab our graphic below, link to one (or all!) of us and then share your Friday Favorites!!! 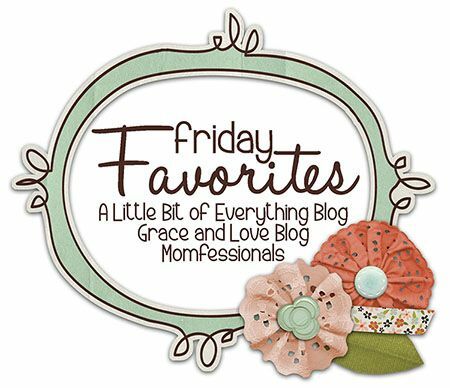 My Friday Favorites this week are random (per the usual) and first up is a new online boutique I came across through GROOPDEALZ, Taralynns. I ordered this super fun polka dot chiffon maxi skirt because it INSTANTLY spoke to me. It's totally my new FAVORITE. :) My motto is "wear what you love" and so I did! It is completely impractical, but totally cute. I ordered it and then sought her out to see what other cuteness she had. I paired the skirt (which you can find here) with a chambray shirt from GAP a few seasons ago (similar shirt here) and lots of bangles. Sidenote: I get TONS of questions about my bangles... I'm planning an "Arm Party" post for next week - so stay tuned for all the deets. 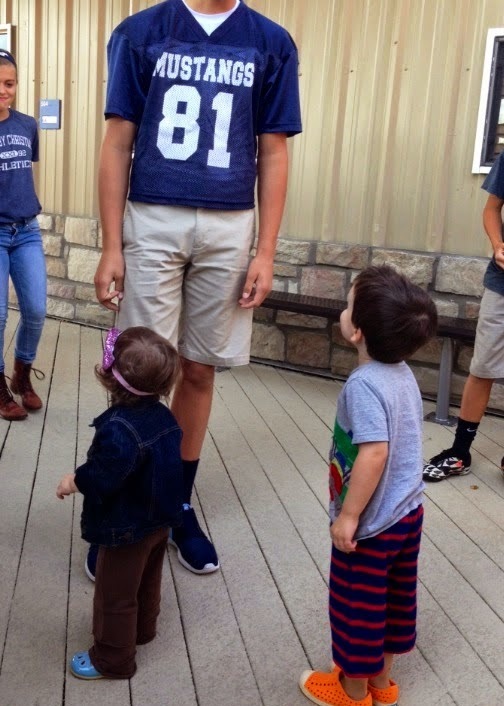 Mason kept commenting on how BIG all my kids are at school, so of course my tallest 7th grader had to come say "hey" :) When they were leaving Mason told Dave that he wanted to me a giant too when he grew up :) One of my FAVORITE parts of my job is seeing how awesome my students are with my kids. LOVE! In case you missed it, I shared one of my FAVORITE recipes HERE on Wednesday and talked about one of my FAVORITE new friends HERE on Tuesday. I'm excited to check out all your FAVORITES this week!!! Love you Andrea!!! Follow you on Instagram and love seeing pictures of your kids! Your kiddos are too cute!!! G in her pjs is just about the cutest thing I've ever seen! Eeks! Love her! Happy Friday!! What a cute photo of your daughter and her big pink mirror! Loving your polka dot maxi skirt and tribal sweater! Looking forward to your arm party post next week! LOVE all your outfits! And my little one who is 1 loves the cozy coupe shopping carts so much that he full on melts down every time I take him out of them. I might be annoyed if he weren't so cute when he does it! That tribal cardigan is incredible! I need it! Happy Friday, girl!! I love that skirt!!! I am going to need to check out that store!!! LOVE how great your students are with your kids...so so so cute! The pic of G in her PJ's...made my day! Griffin is too much! LOL! Love your skirt and I am actually going out this weekend to get Adrian a pair of Natives. They are the cutest shoes! Hope you have a fabulous 3 day weekend! Your clothing is the cutest! I'd be worried I could not pull that stuff off but you look amazing! The polka dot skirt & chambray shirt outfit is the cutest! I think I need a twill jacket, too. Love that tribal cardigan! Thanks for hosting the link-up! Love these Friday posts! Where is your purple top from (the one paired with your green tweed jacket)? I need it! Something is in the air today because the kiddos are stealing the show on every post I have read! :) Cute as always! And those pj's on GG with the bow....DYING!!! I absolutely love that polka dot skirt! I would totally rock that regardless of the situation :) Looks great on you with that denim shirt! Can't wait for the bracelet post! LOVE that tribal cardigan! I might just be ordering one for myself! And love Griffin's little jean jacket, so cute!! I actually ordered that cardigan the other day and I'm so fired up! Nice to find your blog! First time linking up, can't wait to go through everyone's posts - always looking for new fun things! Love that tribal cardigan! Oh my goodness. Griffin's pj's are the cutest things ever! She is a little doll. Love how cute she is always dressed. Makes me smile when I see all of the adorable pics you post! I saw you post that outfit on IG and wondered where it is from, glad that you posted here where it was from! your kids are just the cutest. What is the name of the gold nail polish you are wearing love it!!!! New reader here, and OMG your kids are precious, and those BOWS!!!! If only it were acceptable for a 25 year old to wear those, I would SO be rocking one!! The leopard on Ruby Blue's Etsy and the gold one you have in a newer post? I die. My kids make me happy! They are such a blessing, so full of life and energy!! Last minute just my style.